Every contemporary household should consider having an emergency backup electricity source in case of a power outage. This is where the best portable generator would shine. This is a device that typically runs on some sort of fuel and is capable of providing you with electricity for 12-20 hours, depending on the intensity of the usage and the gas tank it has. You can imagine how convenient this would be in case of unexpected electricity black out during bad weather conditions, for instance. However, purchasing the one that would satisfy your particular needs is not that easy. 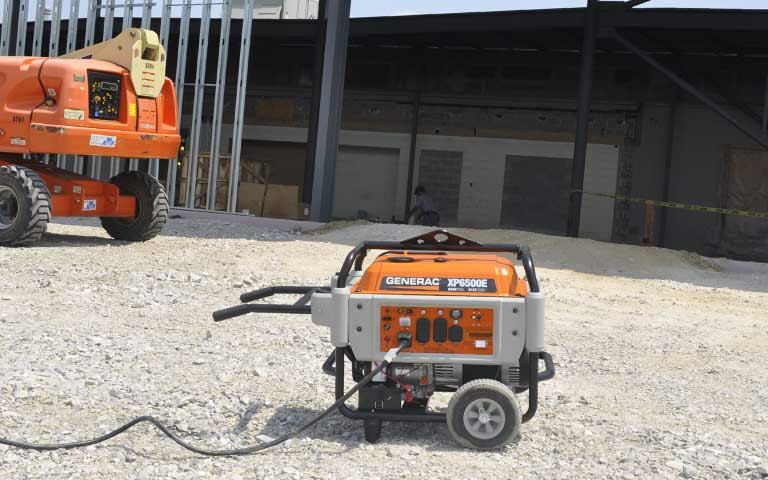 With this in mind, we have compiled a list of some of the best portable generator products on the market during 2019. Read on our portable generator reviews that would allow you to examine and compare their qualities in order to make the best and thoroughly informed decision. Being one amongst the top portable generators, this particular unit is a 4,400 Watt, seven horse power OHV 4-cycle, portable generator, and is powered with gas. DuroMax XP4400E portable generator has a wheel kit installed for further mobility as well as an electric start. The unit has a 4400 Watt surge and a continuous delivery of about 3500 watts. It features a 4-gallon gas tank which is there to ensure that you would be using it for at least 8 hours straight, without having to re-fill the gas tank. The electric key start is also included for further convenience and the battery comes with the package. 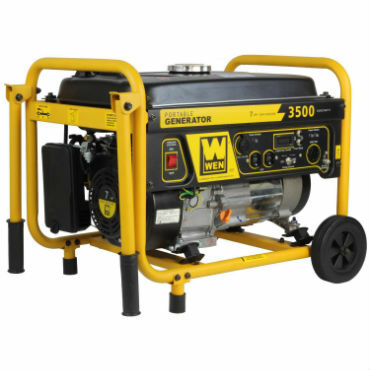 The portable generator is EPA approved and has an automatic low oil shut off. The unit comes with a 120-volt and 20-amp standard household outlets in order to provide a power supply for all of the electrical appliances. It also has a 12/240-vold, 30-amp twist lock outlet that is specifically designated to power up heavy-duty tools. The size of the unit is 36 x 24 x 24 inches and it weighs approximately about 116 pounds. We are looking at one of the top rated portable generators on the market for the 2019. This particular unit has a DuroMax engine that is air cooled and with a power of 7.0 horse powers. The panel of the unit has a lot of controls on it. Some of them include the main controls, start switch, a volt meter as well as a circuit breaker. 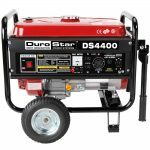 DuroStar DS4000S has two 120-volt, 20-amp, 3-prong outlets that are specifically designated to provide power supply to all of the appliances that are for general domestic usage. It also features one 120-volt, 30-amp outlet that is designed for more high-powered tools. The machine has a 4-gallon gas fuel tank that has an easily readable gauge that would enable you to know the amount of gas that is in at all times. This amount of fuel would allow you to operate the generator for about 8 hours straight. The unit comes in a 23 x 18 x 17.5 inches size and a rough weight of about 94 pounds. However, it doesn’t have wheels but only a sturdy solid metal frame which makes it rather hard to carry around. 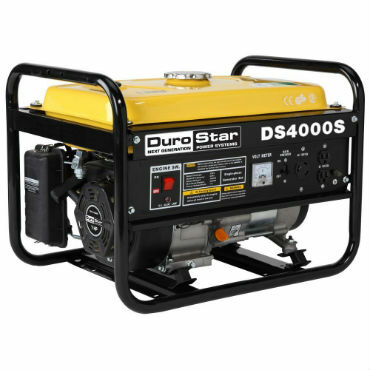 Check out our full review of DuroStar DS4000S portable generator. This particular unit is known to be one of the best quiet portable generator. This is not without a proper reason. 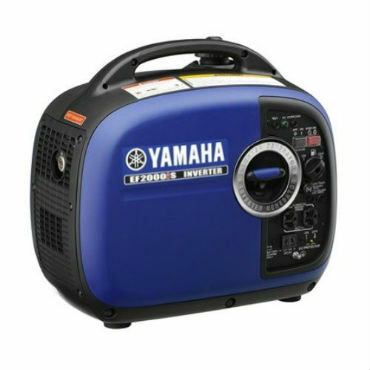 Yamaha EF2000is generator has a 1600 watt rated AC output and a maximum AC output of 2000 watts. 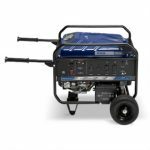 It is capable of powering13.3/16.7amps at about 120 V.
The unit is incredibly quiet with the USFS-approved spark arrestor which allows the portable generator to operate at 51.5 dBA noise level at ¼ load. As you can see this makes it rather suitable for domestic appliances and would surely allow you to work without disturbing those around you. It features a Smart Throttle function that would change the speed at which the engine is working based on the load. This significantly contributes to fuel economy and would further reduce the noise that the machine does. It has an inverter system with a Pulse Width Modulation control options. The unit is CARB compliant. It comes in a 19.3 x 11 x 17.9 inches size and with its approximate weight of about 44.1 pounds, this portable generator really lives up to its name and is quite easy to carry. This is one of the most powerful and surely amongst one of the best home portable generators. 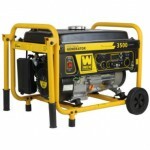 Westinghouse WH7500E is a portable generator that is powered with gas. It has a 4-stroke, 420 cc overhead valve engines and features both electrical and manual start. The generator is capable of running at 7,500 watts and it starts on 9,000 watts. Despite its significant capacity and size, the unit is delivering a rather quiet operation thanks to the Pulse-Flo muffler. It also features a simplified control center as well as an LCD hour meter. 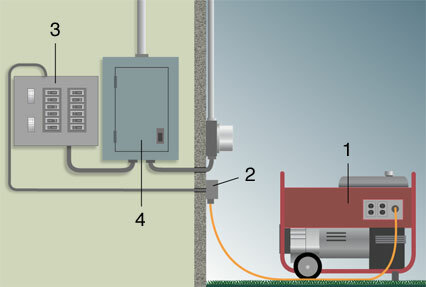 The full enclosure of the generator is specifically designated to protect the electrical connections from the weather. It has four 120-volt outlets and one 120/240-volt twist outlet. The unit is not CARB compliant and unfortunately, it can’t be sold in California. The unit has a size of 27.2 x 20.5 x 22 inches and the significant weight of 201 pounds. The weight won’t affect the portability because the unit comes with installed wheel kit. 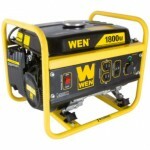 This is without a doubt one of the top portable generators for home use as well as for professional use. It features a digital readout that would tremendously help you in the endeavor of managing the oil changes and update you on your maintenance schedule. It has a low-oil shutdown and overload protection features which ensure the safe operating process at all times. The unit has 11 hours of working time when it is only half loaded. It also includes a wheel kit as well as foldable handles that would allow you to easily transport it from location to location. The foldable kit also allows you to easily store it away because it won’t be taking much of your valuable storage space. The 212cc engine is capable of providing 3500 surge watts as well as 3000 rated watts. It also has two 120-volt, 20 amp outlets and one 120/240-volt, 30 amp twist lock outlet. The size of this particular portable generator is 23 x 17 x 17 and it only weighs around 103.3 pounds which make it incredibly portable. The unit also features a light that would let you know if there is power to the desired outlet or not and thus eliminate the need of using any kind of meter. This is one of your go-to choices of the best portable generator for the money you want to spend. It is a rather economical solution because it is not as expensive as the other devices. Regardless of that fact, this portable generator has a lot to offer. The unit is EPAIII and CARB compliant which means it could be operated and sold in all of the 50 states. However, for proper usage, you could simply refer to the user manual. The unit is capable of delivering 1800 surge watts and 1500 running watts which are capable of providing power for both times of emergency and recreation. The unit is rather lightweight and compact. It is capable of running for about seven and a half hours at half load. This is if it has been filled with about 1.45 gallons of gasoline. The unit also features a low-oil shutdown which is designated to protect the 4-stroke OHV engine from damage while the spark arrestor is there to enable you to freely use if you are camping in parks and forests. The size of the unit is about 19.9 x 15.9 x 17.1 inches and it only weighs about 50 pounds which makes it incredibly convenient, easy to carry and easy to store. Having some of the top portable generator ratings on the market in 2019, this unit truly brings a lot of benefits into your home, should you choose to purchase it. It is capable of delivering 1200 rated watts and has a maximum output of 1500 watts. It has one 120V outlet. The unit is powered by 80cc OHV engine that comes with a cast iron sleeve and is manufactured by Champion. The device is CARB-California approved, unlike many of the other portable generators. It is capable of running up to 10 hours with a full tank of gas, operating at 50 percent load. The unit also comes with 2 years limited warranty. It features a very durable frame, overload protection, low oil sensor as well as a voltmeter. The unit is also covered by the lifetime free technical support that the Champion company provides their clients with. The unit has a length of 17.7 inches, the width of 14 inches and height of 14.8 inches. It has an approximate weight of about 61.7 pounds which makes it not so hard to carry around. If you had to make a portable generator comparison you are likely to find out that this unit, in particular, is one of the best on the market in 2019. It comes with the Generac’s OHV engine that has splash lubrication and this will provide you with a long engine life. The unit features an electric start with a battery and a plug-in battery charger jack for your further convenience. It has a sensor that would enable the device to know when the oil levels are low which would allow it to automatically shut down and protect the engine from damage. It also has an hour meter in order to let you track the maintenance intervals. The unit has a large-capacity fuel tank which also features a fuel gauge which would provide you with durability as well as extended running time. The hardened steel tube cradle is there to deliver additional durability as well as strength to the construction. The unit has a solid weight of about 201 pounds and a size of 28.8 x 26.8 x 26 inches. Regardless of the significant size, this portable generator is easily moved from one location to another, thanks to the conveniently installed wheel kit. 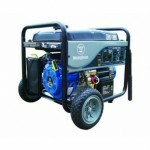 This unit is one of the top 10 portable generators that we have chosen to present you due to the qualities that it has. It delivers 3500 rated watts and has 4000 watts maximum output. The generator features one 120V duplex outlet, one 120V twist lock and one receptacle. The generator comes with a remote control that would enable you to turn it on and off with an included battery. The device is powered by the Champion 196 cc OHV engine that features a cast iron sleeve. It is also CARB – California approved, unlike a lot of other portable generators. It is able to deliver said capacities for 12 hours of operation on full tank gas when it is 50 percent loaded. The engine oil is also included. The unit has a length of 28.5 inches, the width of 21.1 inches and height of 20.7 inches. Despite the significant weight of 140 pounds, the unit is pretty versatile and portable due to the fact that it has an installed wheel kit which is designated to move it around easily from one place to another. The unit is covered with a lifetime free technical support and a two-year limited warranty that would enable you to rest assured that the product is going to be taken care of in cases of malfunctions. This is also amongst some of the greatest domestic power solutions. It includes power lights and it gives you the opportunity to easily power up CPAP machines as well as TVs anywhere you are with the built-in AC inverters. 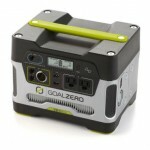 The generator is chainable with other Goal Zero Yeti 400 in order to deliver longer running times. It is absolutely safe for indoor usage. The car or sun car charger, as well as the solar panel, are sold separately. It has one 1.5 ampere USB outlet, 12 volts outlet as well as 300 watts pure sine AC inverter which is all included in the package. The item can’t be returned. You can easily charge by connecting it to a compatible solar panel as well as plugging it into a regular wall outlet which provides quite a lot of versatility. You can also charge it by connecting it to the 12V adapter of your car. The unit has small size of 8 x 10.2 x 8 inches and it is also quite light with its weight of 29 pounds which makes it incredibly portable and convenient for appliances that do not require a huge power source to run. A portable generator is typically a gas or diesel-powered solution which would provide you with temporary electricity. However, there are units that are chargeable with electricity as well such as the solar portable generators. Nevertheless, users of these kinds of devices could plug the electrical appliances directly into the sockets of the generator, provided that it offers a compatible socket. Usually, they have a variety of sockets because they are designated to satisfy almost any kind of power demand. The generator could be also professionally installed into the panel of the home and used as back-up electricity source in cases of electricity blackouts. The portable generator needs to have quite a few regulators on board because it uses a combustion engine to generate the electricity. However, this does not apply to generators that are electrically charged like the solar portable regulators. The engine has to turn at around 3600 rpm just to generate the 60hz of current in the typical North American home. There are precautions that are installed within the generator that is able to prevent the engine from spinning out of control. There is also a regulator that has the sole purpose of limiting the output to 120 volts in order to keep the motors from burning out. A portable generator is normally designated to serve only as a temporary generator and this is stressed out enough by the fact that they have limited gas tanks that would only allow you to use it for some hours. The size of the gas tank is going to determine how much time are you going to be able to use it but the best ones are capable of supplying you with electricity for about 14-20 hours, depending on the intensity of the usage. It is safe to say that a portable generator is truly a great addition to your home because you can rely on it to provide you with enough electricity to last you through some emergencies. But have you ever wondered how are they working? How do those devices manage to produce electricity? Here you are going to find some answers to those questions. The first thing you have to know is what the generator is actually made of. Any portable generator would typically consist of a power generator head, an engine, a fuel source as well as some power outlets. These items are commonly referred to as engine-generator set. The generator head is basically the part that is going to be producing the electricity which is supplying the power outlets. The engine would run the head which means that the engine would require some sort of fuel in order to operate. Now, most portable generators use gasoline, diesel or liquid propane, but there are also some who actually use electricity. Solar panels are chargeable and the electricity is used to trigger the engine without using fuel. Anyway, regardless of what kind of fuel you are actually using, the engine is going to provide the energy which is needed by the generator head by spinning a shaft. There is a part that is called speed regulator and the sole purpose of this regulator is to control the speed of the spinning. In any case, a cooling system is also a must as well as some sort of lubrication for the parts that conduct a motion. This is where the generator head kicks in and starts converting the mechanical energy into electricity in order to supply the outlets with power. Once the electricity is produced it is also available for the outlets that are installed on the portable regulator. These outlets depend on the model that you have purchased. There are portable generators that come with all sorts of outlets, there are units that only come with one standard outlet and there are units that only combine the most conventional and commonly used outlets. However, the wide variety of outlets is there to ensure that your need for electricity would be thoroughly satisfied. You can’t achieve that without having the right outlet. Imagine the situation in which you have to plug in a heavy-duty industrial tool in order to carry on some work in your garage and you only have a standard 120V outlet. This is why picking the portable generator according to your electricity appliances is so essential. You don’t want to end up with a generator that you cannot use simply because you have mistakenly purchased the one that does not supply the necessary outlet. Therefore, always keep a close look on this in order to be sure that you have made the right choice and that you haven’t just thrown your money away. As all kinds of devices, portable generators could be subjected to basic differentiation based on various different qualities. For instance, you can create a list based on the fuel they require, the electricity output they are capable of providing, the running time on one full gas tank and so on and so forth. However, for the sake of being greatly beneficial, we are going to provide you with the most basic yet informative differentiation which is based on the way portable generators are going to resolve your emergency electricity problem. With this in mind, these are the two types. These are generators that are usable with extension cords. They are the simplest and least expensive solution for your backup power supply. You are advised to keep the generator at least 10 feet away from your home in order to avoid carbon monoxide poisoning. This is the most basic technology that you could use to satisfy your backup power solution. You should run the generator in your yard and simply plug in the extension cords which come from the desired appliances. This is also the cheapest option because you won’t be required to hire a specialist that would take care of the electricity issues. The major drawback of this particular solution is that you would have to run those extension cords literally everywhere you would want power. You should also keep in mind that these portable generators usually have a limited number of outlets so you would only be able to plug in a few appliances at a time. When the power goes out you should place the generator out on a flat surface, far enough from the house. Make sure that the area is dry because you are operating with an electricity source and as you may know electricity and water are not a great combination. However, once you have made sure that it is properly set up, simply turn it on and plug in the extension cords and you would have your electricity supplied. This particular type would automatically turn on once the electricity is down and you won’t be required to do a thing. However, not all of these devices are portable and in fact, most of them are designated to be used as stationary solutions. Nevertheless, they offer great convenience due to the fact that you won’t have to bother setting them up every time your electricity goes down. In any case, these generators are far more expensive than the plug-in alternative and you have to be prepared to spend a substantial amount of money if you want to equip your home with such a solution. Make sure that you properly identify the need of electricity back up before you make your final decision. Don’t overspend on standby generators if you don’t live in an area where electricity blackouts are not very common because you won’t be able to take the most advantage out of them. Go for the plug-in option instead because this would surely save you some initial money. Owning a portable generator is truly something that is going to greatly increase the sense of security that you have in your home. This is due to the fact that you won’t be worrying whether or not the electricity may stop during bad weather conditions or if there are some sorts of repair works going on in the area nearby that may be interfering with the electrical system. You can rest assured that regardless of what happens you are going to be covered in terms of electrical supply for the next 12-20 hours, depending on the type of generator you have purchased. However, choosing the right one is not as easy as you may think. There are a lot of technicalities that need to be taken into proper consideration before making a final decision. The first step towards buying the appropriate portable generator is to properly identify the particular need you have for alternative power supply. There are quite a few scenarios. 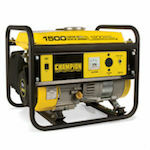 If you need a portable generator that you are only going to use when you have no electricity due to a black out, you should determine how often these situations occur. If you live in an area where electrical blackouts are common you should consider buying a bigger portable generator with a larger fuel tank that you can use for a longer period of time. The best thing you could do is to get a standby generator that would turn on automatically. However, if you don’t have or you don’t want to spend that kind of money, a normal portable plug-in generator would also do the trick. If electrical blackouts are not something common, you should definitely buy a regular plug-in portable generator in order to save some money. Try to figure out the approximate duration of those blackouts in general and shop accordingly. You won’t need a generator with a huge fuel tank if the blackouts are rather short. If you want to power up tools because you are commonly working on building sites that do not have electricity provided, you should consider buying a portable air generator that is capable of delivering a bigger rated wattage. You should also consider the outlets because most industrial tools require specific outlets that normal portable generators won’t be providing. 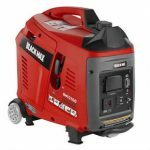 Keep in mind that the first section of this guide is offering a detailed review of the top portable generators on the market during 2019. You can use it to properly compare the advantages and disadvantages of the different types and opt to get the one that would properly accommodate your particular demand for electricity. Of course, this is the most important thing you should do. In fact, this is also the first thing you should do. Setting up a budget in advance is going to automatically eliminate the options that are exceeding this budget and thus limit the choice you would have. However, there are a lot of flexible offers out there that you would need to consider. Of course, you might have limited your budget simply because you don’t have the need to buying a generator that is extremely expensive because you wouldn’t be able to find proper applications for it. Keep in mind that in this particular area quality is not necessarily related to the price. There are excellent portable generators that come in quite cheap when you compare them to others. And the fact is that they are going to provide the same amount of electrical supply. The difference comes from the overall performance of the unit. More expensive ones tend to perform a lot smoother and quieter, but if you can’t afford them, this is not something that should concern you that much. After all, a portable generator is always only an alternative. There is a huge difference between a portable generator that is capable of delivering a rated wattage of 3000 and one that it is capable of delivering 7500 watts. This is why you must be aware of what those things actually are. We advise you to take a look at the section that explains how exactly those devices work in order to properly understand the importance of the parts that are involved in the production process and why is it important that they come with the right specifications. For instance, you shouldn’t buy a generator that doesn’t have speed regulators. The speed regulator is going to limit the maximum spins that the generator shaft is going to be working with in order to prevent the whole thing from overheating. Improper usage of the generator might cause the whole thing to go south in the blink of an eye so make sure that you have purchased a unit that has as many display gauges as possible. This would enable you to keep track of everything that goes into that box without being left out and without having to make annoying and difficult maintenance checks. As you can see, there are a lot of things that have to be accounted for when shopping for a portable generator. However, you will quickly understand that once you have made the proper choice, this device is going to provide you with a significant amount of advantages and different applications. When it comes to manufacturers of portable generators there are several companies that definitely stand out and ring a bell. Their logo on the device alone is a proof of quality and durability, so let’s take a look at some of the top portable generator brands out on the market. 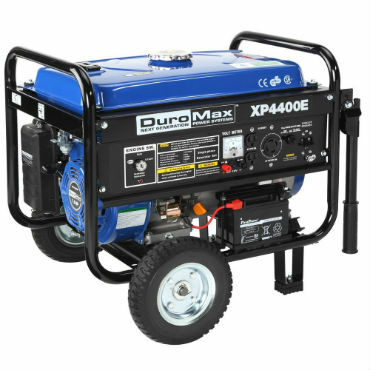 Duromax is aware that the criteria for choosing the right portable generator would greatly hide within the particular usage that you have in mind as well as the amount of total wattage that you would require from the engine when running. This is one of the main reasons for which this company has thrived to produce such a large variety of different portable generators. The company has a unit designated to satisfy all of the potential needs for a portable generator. The devices range from small and portable generators designated to power up a couple of electrical appliances during an emergency, all the way through generators capable of powering up heavy duty industrial instruments. The Generac company is considered to be one of the leading names in the field of home backup generators. It was founded in 1959 and it was the first manufacturer to engineer an affordable home standby generator. Now the company is the number one producer of conventional and easy to operate backup generators. The company provides all sorts of electrical backup solutions capable of answering to every possible demand of the client. Their products are built to last and to satisfy a variety of different needs for both domestic and industrial applications. Since 2003 Champion Power Equipment has made a name for itself of designing as well as manufacturing some of the finest power equipment on the market. The original headquarters of the company are in Sana Fe Springs in California but due to the increased workload, they have expanded to include facilities in Jackson Tennessee, Milwaukee Wisconsin as well as Toronto in Canada. This fast and broad expansion really speaks about the demand of generators they are capable of meeting. This also signals the customer about their quality because where there is huge demand there is also a corresponding quality. The company has sold over 2.5 millions of generators in North America alone, and it has quickly grown to become of the leaders in the power equipment field of expertise. Powermate is also one of the world’s leading portable as well as standby generators manufacturers. The versatile line of portable generators these guys offer makes it possible for every customer to find a proper solution to their backup electricity problems. The activities that you can get covered using a device manufactured from this brand range from recreational to industrial. You can find a generator that would allow you to go camping without worrying about electricity as well as to find a solution that would enable you to properly handle a DIY project. In any case, the wide range of generators that is provided by this company has a great effect on customers. They also meet the highest expectations in relation to quality standards. The company was founded in 1886 and for more than 125 years, which is quite a significant period of time, Westinghouse is a brand that stands for reliability and innovation. The company has merged with the Westpro Power Systems and the resulting synergy enabled the engineers to study, manufacture as well as to market a whole line of perfectly designed portable generators. This is an example of how working as a unit could enable you to achieve greatness. The broad and extensive experience that this company has alone is an enough evidence of the quality that hides behind this brand. With a reported sales in the fiscal 2014 of 1.9$ billion, Briggs and Stratton is one of the world’s largest manufacturers of gasoline powered engines for outdoor power equipment. The company has its headquarters in Milwaukee, Wisconsin. The products of this company are designed, manufactured, sold and maintained in over 100 countries across six continents. If this isn’t a sign of a reputable company then I don’t know what is. If you find the stamp of the company on a product, this is a clear mark of high-end quality and durability. Honda. Models that are worth checking out: EU2000i. Troubleshooting relates to the process of repairing simple yet common problems related to various technical solutions. Portable generator troubleshooting directly relates to repairing your generator. With this in mind, let’s take a look at some of the few things that you need to know in order to operate your portable generator as intended without any flaws. Utilize a battery and connect the wires from the portable generator directly to the battery. Make sure that you are attaching a negative port to another negative one and a positive to a positive port. The wires are generally going to be color coded for your further convenience. Get rid of the spark plug from the generator and make sure to pull the starter cord in order to get it up and running again. The other method would require you to use an electric drill in order to attach the 120-volt receptacle of the generator and start the latter. It is possible and even highly likely that from time to time the generator is going to be running by you wouldn’t get any power. If this is the occasion some internal setting could have been changed or the motor itself might have been damaged. In order to check this out, make sure to obtain a voltmeter and an ampmeter. The first thing you want to do is to open the user manual of your portable generator and see what the right settings should be. Use the listed devices in order to check if the generator has a similar reading. If it doesn’t you are most likely facing an internal issue. If this is the situation you should definitely turn to a professional. 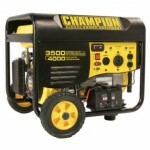 You might have to spend some money but it would definitely help to get your generator up and running once again. If the problem is of this particular nature, hiring an expert is almost mandatory. This is due to the fact that you are going to have to operate with electrical system which is a potential hazard. You don’t want anything to go wrong when using such heavy machinery so let the professionals do the job. The best way to prevent things like this from happening is if you properly maintain your portable generator. Make sure that there is always lubrication in between the moving parts in order to ensure a smoother electricity production, a safe working environment as well as a longer engine life. Remember to use good quality oil as well as fuel because these substances circulate throughout the entire system and you definitely don’t want to get it filled with dirt. Maintaining your portable generator is surely going to prevent a lot of unnecessary repair works which would undeniably translate to some serious savings on your behalf. However, there are quite a few things that you might want to take into account, so here are some of the basic and most helpful tips regarding portable generator maintenance. Make sure you have enough oil and filters. Most of the new generators would need to get the oil changed after just 25 hours of usage. After this you would still have to change the oil and filters with new ones after every 50-60 hours of operation. This is why you would want to stack up on those materials if you want to ensure the long life of the engine of your generator. Make sure that the generator is properly chilled out before you refill it. The fuel tanks of the portable generators are always going to be located on top of the engine and as you can imagine things could go south rather fast if you spill gas on the engine if it is hot and running. This is a potential fire hazard and it would undeniably hard you as well as the generator so make sure that you have made sure that the engine is cold enough before refilling the gas tank. Don’t allow the device to run out of gas. 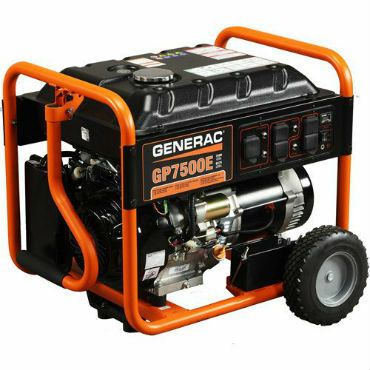 Running out of gas, especially in cheap models could very much damage the generator itself. They would keep putting out the power while coming to a stop and at the same time the electrical load of your house is going to drain the magnetic field out of the coils of the generator. When you restart the machine it would seem to be running just as fine, but in fac, it won’t be generating any power. You will have to take it to the repairing mechanic who is going to charge you approximately 50-60$ in order to reenergize the coils. This would be even more expensive if the coils have to be replaced. Do not use old fuel. If the fuel in your portable generator is old you should empty the gas tank with a hand pump before running the whole carburetor dry. When you have to use it again simply pour in the fresh gasoline. Old fuel is the most common and thus prime cause of starting failures. Manufacturers actually advise to add a fuel stabilizer in order to prevent or at least minimize the fuel breakdown. Make sure that the fuel does not stay in the tank for a significant period of time. With this in mind, it is best if you change it after the end of the storm season. Remember to store it at a safe location. These units are called portable for a reason. This means that they are specifically designated to be easily moved from one location to another for your own personal convenience. However, there is another side to this coin. 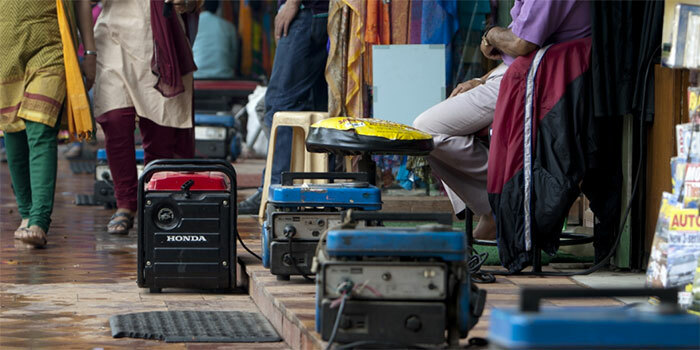 Because of their mobility, portable generators are also the target of thieves. They are easily and rapidly sold on the market and no one would pay attention to whether or not they are stolen if you sell them in the black market. Thieves prefer stealing such devices because this is an opportunity to make some quick and easy money. Therefore, in order to prevent this from happening make sure to lock it down with a chain to something that can’t be moved. Portable generators are known for their mobility and portability, which makes them the perfect electrical backup solution. With this in mind, let’s take a look at some of the best uses for such a device. 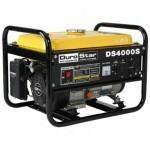 It is a good idea to have a portable generator backed in your home in cases of electricity black out. With this device you won’t have to worry ever again about losing your electricity during the middle of the night. However, losing the power itself would have absolutely no effect on you in particular but the truth is that with the advancement of science, we have become so reliant on technology that it is hard to imagine a situation in which we can’t use electrically powered machines like TVs, refrigerators, air conditioners and many, many more. A portable generator would eliminate the need for you to run long extension cords at the job site or to worry whether or not you will be able to power up your tools. Not every single job site is going to be connected to an electricity supply line. In fact, most new building sites that are not yet properly wired won’t have access to any kind of electricity and a portable generator might as well save the day. Just make sure that you have enough gas and you are pretty much all set. This is especially handy for the youngsters. If you have ever planned on partying in the woods or on a field or out on the pool and you have no way to power up your stereo sound, the portable generator is going to provide you with the electricity you are going to need. However, you should be extremely careful and it is best if you use a long extension cord in order to store the portable generator somewhere far enough from the crowd just to make sure that everything will be safe and sound. If there is some sort of natural disaster, you are almost inevitably going to be left out without any electricity. This is a situation in which you are going to be very grateful that you have purchased a portable generator because it would surely solve your electricity problems. And in situations like this electricity could be an essential thing to have. It is impossible to stress it enough exactly how convenient small portable generators are during long field trips. You can easily power up a lot of kitchen tools as well as other applications while you are traveling by using a portable generator. It doesn’t even need to be gas fueled, you can use an electrical one and you can power it up from the battery of your vehicle. No matter how many advantages portable generators bring to the table, it is important to understand that these devices could be quite dangerous if used without the proper precautions or against the user manual. Regardless of their portable dimensions, most of the generators are capable of delivering a significant amount of electricity and this should be accounted for. With this in mind, here are some safety tips to ensure proper and sage usage. That’s right, portable generators should not be used indoors. This includes a garage, basement or basically any enclosed or partially-enclosed area. Even if the area is thoroughly ventilated, you should avoid using the portable generator inside it. This is due to the fact that the engine operates on fuel which exudes a lot of CO. This could lead to fast full incapacitation and even death if there isn’t anyone to help you. This is due to the fact that in order to generate such a high wattage, the generator is absolutely going to get heated up, significantly. Make sure to cover it with something in order to prevent dust or moisture to get inside. You should also make sure to properly lubricate the moving components that are within your generator in order to ensure longer engine life and to prevent any malfunctions that might cause a potential health threat. You should always perform a dry run of the portable generator in order to be fully familiar with its specifications. This would also allow you to properly utilize it during a power outage. 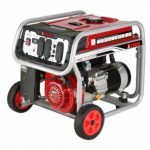 In conclusion, the right portable generator is a significant addition to your home that would save you a tremendous amount of worries and headache in some particular events in which you have run out of electricity. In addition, a portable generator provides a lot more sense of security because you know that no matter what happens you are always going to be able to rely on this device in order to provide you with an additional amount of power supply. However, choosing the best one is not a walk in the park. 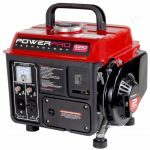 There are a lot of different things that you would need to account for and this is why this list of the best portable generator reviews has set out to make your life a bit easier in this regard. Nevertheless, once you have obtained it you will immediately feel the benefits that it comes with.